We did it! The awesome Ashland Culinary Festival 2017 in the books. Honestly, it gets better and better every year and I am super grateful to be a part of this event and journey. 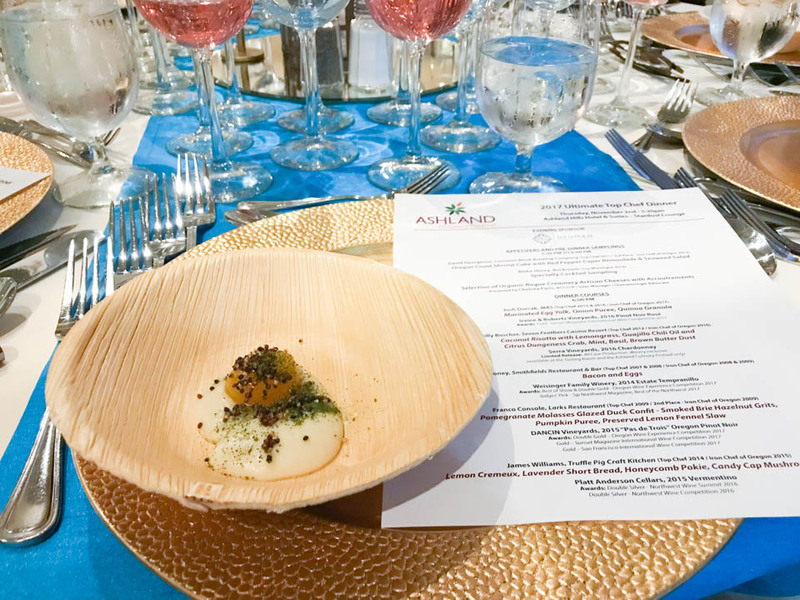 There is so much that goes into events like this and it has grown to be a great place for the community and tourists to gather every fall at the beautiful Ashland Hills Hotel. Tourists, bloggers, Travel writers and photographers from all over came to experience this year’s festival. It was a joy to meet each of them and get their perspective on this awesome event! Everyone loves Ashland, it’s such a beautiful place to visit and with the fall colors it was especially lovely. Thursday night I was lucky enough to enjoy a top chef dinner prepared by past winners of the festival. 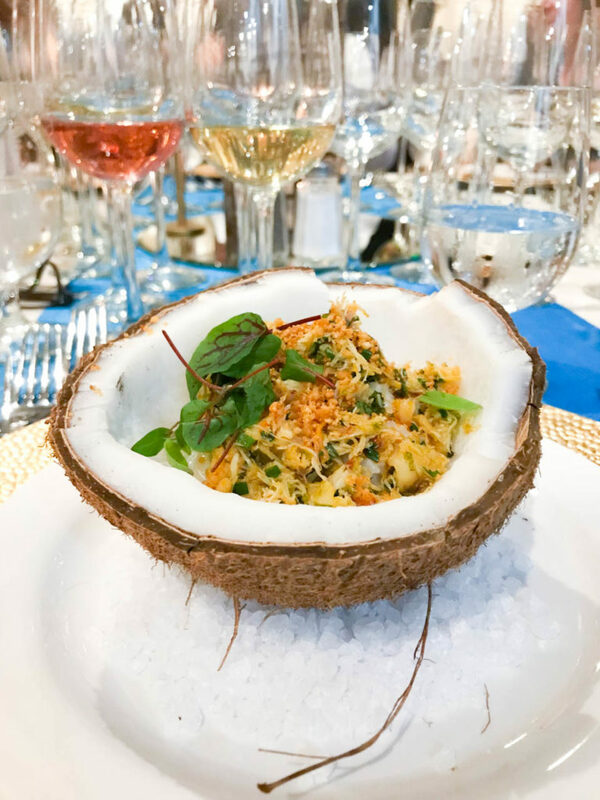 It was a four course meal paired with amazing award winning Southern Oregon wines. 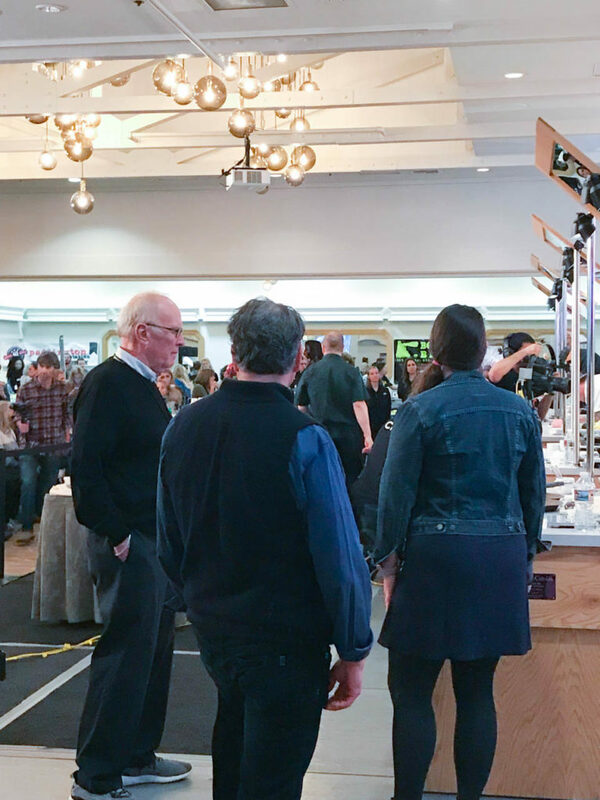 I was sitting at the winemakers table and I learned so much about viniculture, I I know very little about wine and it was a treat to learn so much from the awesome wine makers. Another good reason to visit Ashland! The entire weekend was full of food, wine, beautiful fall colors and nature, and tons of fun. Friday night there was a new event called the celebrity quick fire. This is where myself and fellow judges, Chef Cory Schrieber and Chef John Ash, as well as past culinary festival winner Neil Clooney competed against each other in a 15 minute competition! We were given a secret ingredient box to make grilled cheese sandwiches in 15 minutes. It was an excellent way to have the judges be on the other side of the table competing against one another. And on the flipside the past winners Josh and Billy were our judges. So we all got to experience what it’s like to be in each other shoes, an excellent way to learn from each other and experience something new! I’m not competitive at all and I was super nervous to do the competition LOL! I’m so happy I did it and had so much fun, I actually can’t wait to do it again next year! 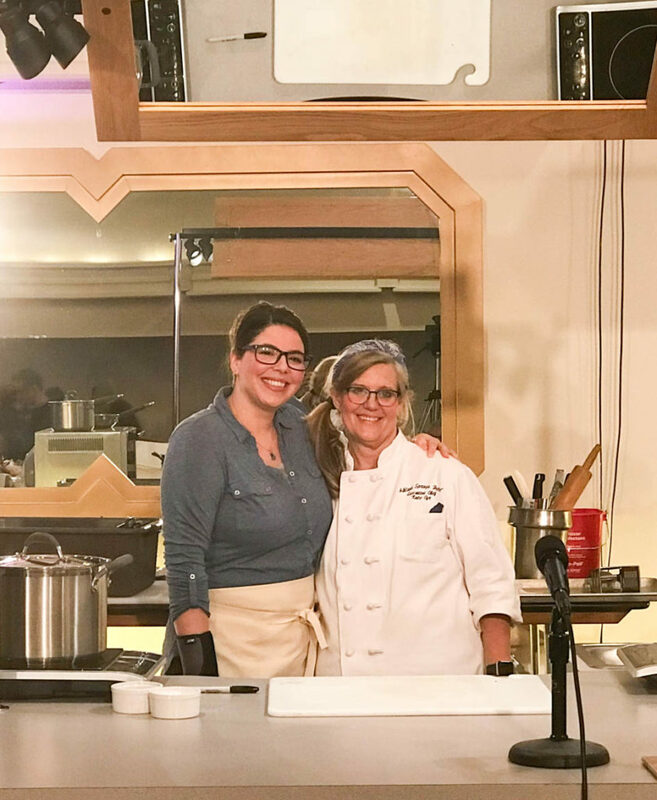 I was paired with the beautiful chef Kate from Ashland hills hotel and Carol from Charlie’s produce, we came in second place! But I’ve got to say we lost to the awesome James Beard award winning chef John Ash and Dennis Slattery. It was awesome! The fun doesn’t stop there. Saturday morning we had our second annual Junior Chef competition which is one of my favorite parts of the weekend. 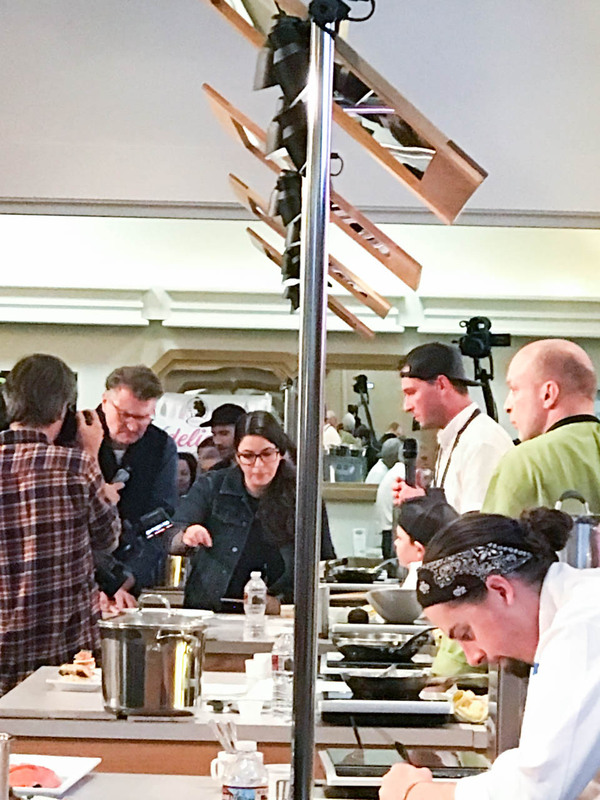 Although it’s tough to pick a favorite, there is something super special about watching younger chefs compete in such a nice way with one another. 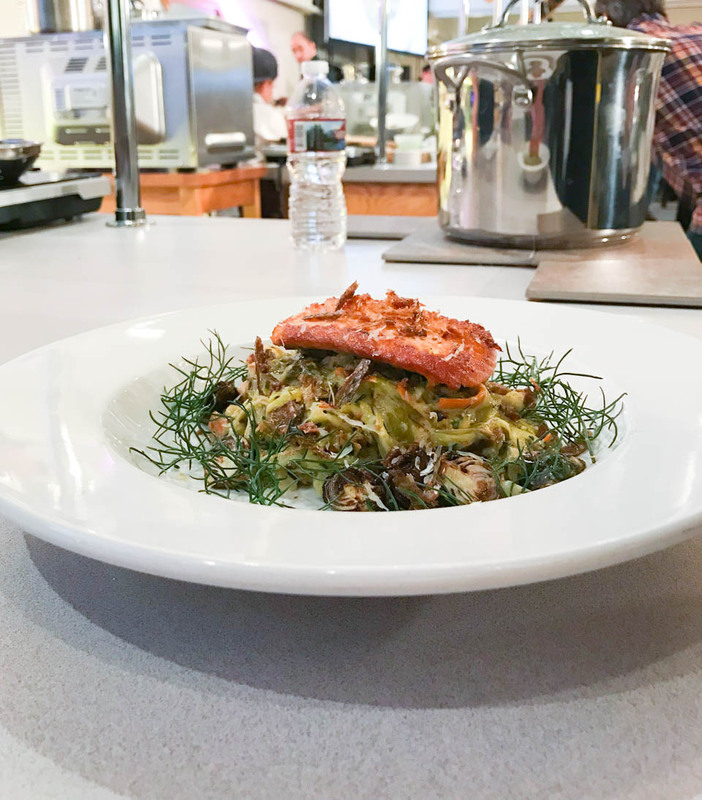 All of the teams did an excellent job and work together to share with us their final dishes. They were very good! 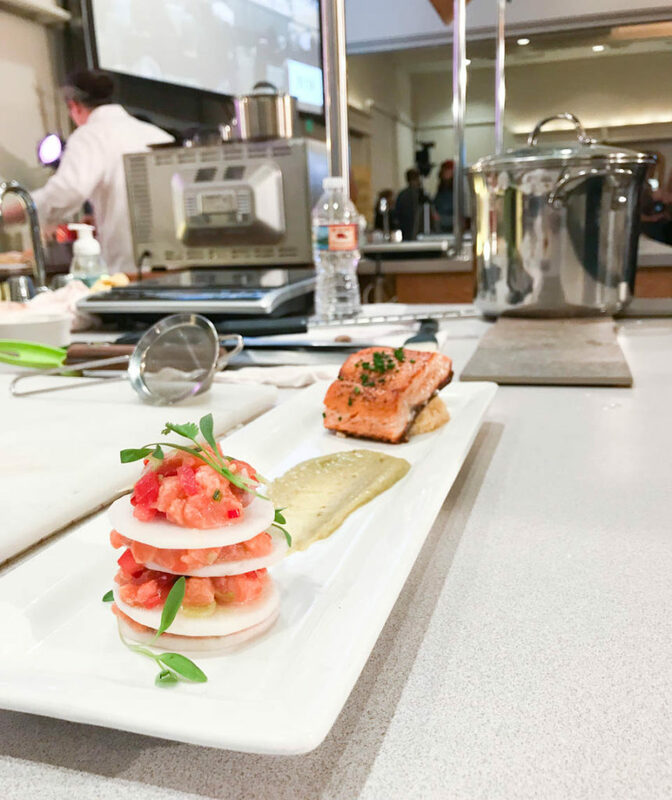 There was a lot of talent on that stage for the junior chef competition and I look forward to seeing what they have in store for us next year. I know they will all go so far. Congratulations to Dezmond Barros and Coy Wimberly, Seniors from North Medford High School for winning the 2017 junior chef competition! There are three rounds with one winner in each round plus a wild card chosen by myself and the other judges that continue on to the final round. Josh Dorcak of MÄS won round one, Skye Elder of Brickroom won round two, and Stefano Cipollone of Standing Stone Brewing Co won round three. The wildcard chosen this year was Brent from Larks restaurant. 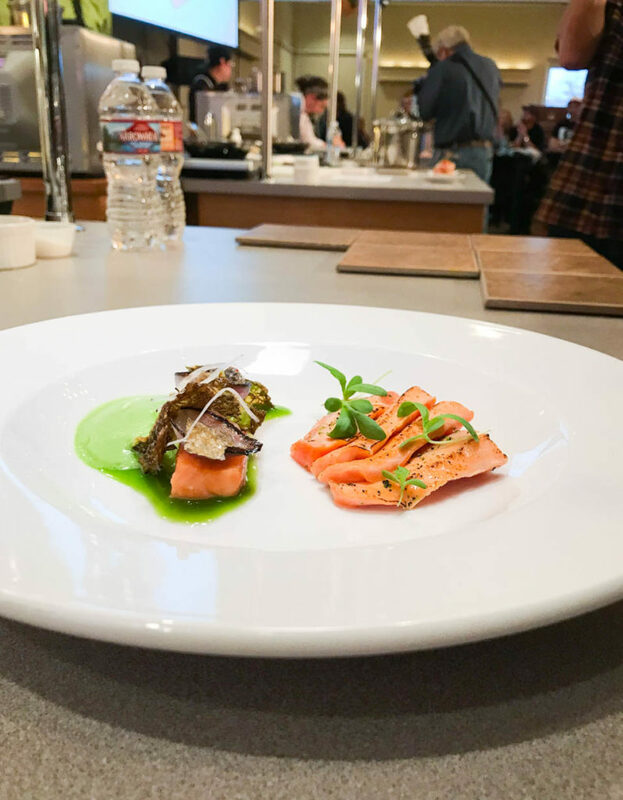 It was an honor to enjoy each of their final round entrées with the secret ingredient being Coho salmon prepared two ways. 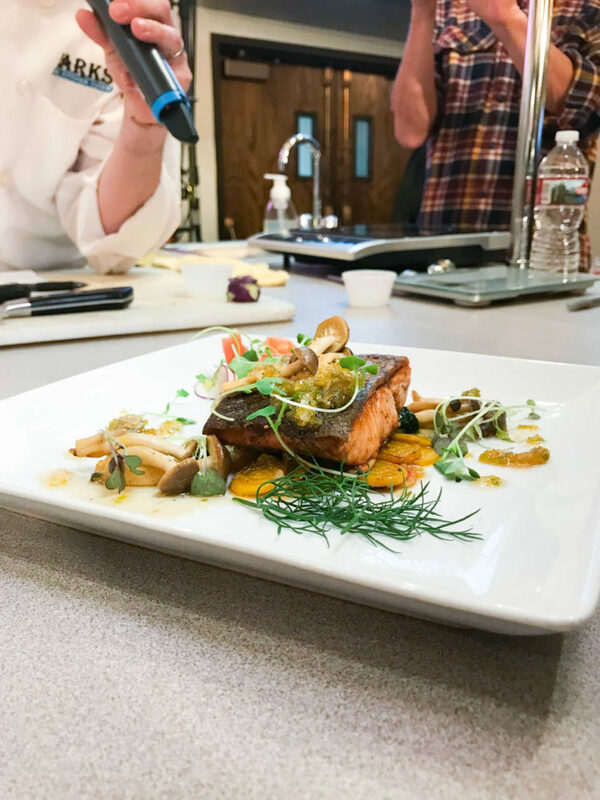 Chef Skye prepared for us a Coriander Seared Coho Salmon with Coconut Jasmine Rice and a Wasabi Caramel Lomi Lomi Salmon Radish Napoleon that was incredible! The wasabi Caramel was the winning part of the dish for me. The lomi lomi with the wasabi Caramel was prepared perfectly with just the right amount of heat, seasoning, acidity, and freshness. I can’t say this enough, I am super grateful to be a part of this event. All of the people that put this together each year give their hearts to making this event what it is. The community that supports these chefs is super special and we couldn’t do this without them! I am also grateful to each of the chefs who put their sweat and tears into their dishes for us to enjoy. There are so many thank you’s to give because there are so many people that make this possible. I love being a part of this event every year and I look forward to many more years ahead! There were many donations to the students for the junior chef competition as well as the Ashland Emergency Food Bank received many donations from ticket sales for this event. Another excellent reason to buy tickets next year for the 2018 Ashland culinary festival. That event will be held at the Ashland hills hotel on November 8-11, 2018. Save the date And I hope to see you there next year! Disclaimer: This is a sponsored post in collaboration with the Ashland Chamber of Commerce. As always all opinions are my own. Thank you for supporting the companies and brands that support NJB!